Charges against Amy Goodman were rejected. But warrants and arrests continue to threaten dissenters, observers, journalists–and honest debate. They issued an arrest warrant for Green Party presidential candidate Jill Stein, after her decision to join protests by Native American tribes and their allies drew attention to the struggle against the Dakota Access pipeline. They issued an arrest warrant for Amy Goodman of Democracy Now! after she reported on physical attacks on protesters. When Goodman announced she would turn herself in, as part of an essential defense of the the rights of journalists to report on news stories, McLean County States Attorney Ladd Erickson came up with a new claim that the journalist had participated in a “riot”—a charge so absurd that a local judge rejected it on Monday. 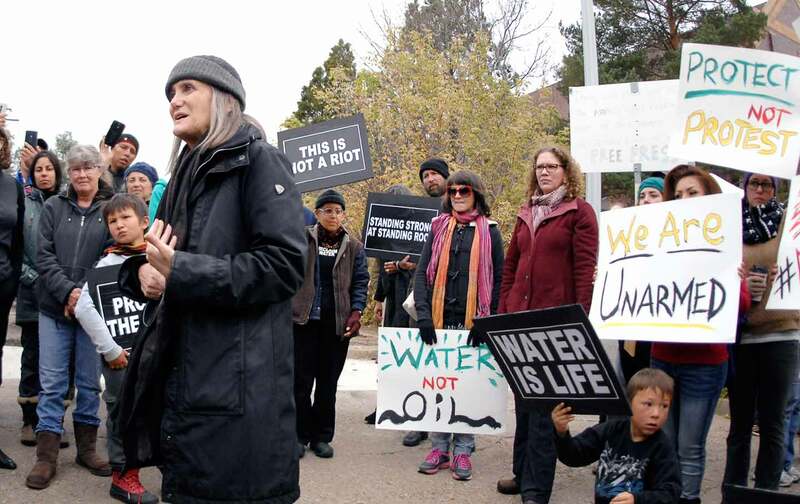 They arrested Madison, Wisconsin, City Council member Rebecca Kemble, an elected official who had observed a prayer ceremony organized by opponents of the pipeline. Her camera was seized as she filmed a police crackdown on Native American activists. By every evidence, North Dakota authorities are waging war against the public’s right to know. The remarkable events that have transpired in North Dakota in recent weeks are jarring, not just for the details of prosecutorial lawlessness but because they offer an indication of what can happen when the state aligns with corporations in order to shut down democratic discourse. Much of the attention to recent developments in the state has focused on the threat to journalism, and that is appropriate. But the moves made by North Dakota authorities to criminalize dissent and discussion of that dissent involve more than just an assault on the clearly established right of reporters to cover conflict by going to the heart of the matter. The abuses by North Dakota prosecutors of their legal authority threaten the ability of people across the United States to learn about the vital environmental and human-rights issues raised by a genuinely controversial pipeline project. Americans have a right to know about the protests by members of the Standing Rock Sioux tribe and their allies against construction of the pipeline. Yet this right to know is under assault. With mass arrests of Native American activists and environmentalists, the intimidation of journalists, the jailing of a prominent documentary filmmaker and of an elected official who was observing protests, the wild inflation of charges by prosecutors who imagine that documentation of dissent is “rioting,” and the failure by authorities to crack down on the violence of security guards working for the pipeline corporation, North Dakota officials appear to be doing everything in their power to tip the balance against the public’s right to know. Prosecutors may claim that they are just trying to maintain order. But their thinking, and their approach, is at odds with our understanding of the First Amendment as the vital underpinning of democracy. A rigid obsession with order that disrespects dissent and the discourse is invariably problematic, explains David Couper, a former police chief who has written extensively on how authorities can and must respect the First Amendment. This messiness draws attention to issues that might otherwise be neglected. And the rapid construction of the Dakota Access pipeline was initially neglected. That changed when the Standing Rock Sioux tribe raised the alarm. What is happening in North Dakota is so fundamentally and so thoroughly un-American. With encouragement from other tribes, environmentalists and social-justice activists from across the United States and beyond its borders, the tribe demanded a halt to construction of the $3.8 billion, 1,200-mile pipeline that Vermont Senator Bernie Sanders says must be stopped because it “will transport some of the dirtiest fuel on the planet.” In addition to concerns about the potential contamination of the water supply and long-term environmental consequences, the Standing Rock Sioux warn that the pipeline threatens tribal burial sites and their cultural heritage. The pipeline protests have over the past two months drawn significant support. Among those arrested last week in North Dakota was actress Shailene Woodley, a star of the recent Oliver Stone film Snowden and the “Divergent” movies. But something Rebecca Kemble said about her arrest was particularly striking. The Wisconsin official is concerned that reporters and observers are being deliberately targeted by North Dakota authorities who want to create a false impression of what the protests are all about. Kemble noted that she was not protesting. She was present as a legal observer, wearing a hat that identified her as such. She said she was filming the police per legal observer guidelines. “I wasn’t protesting. I was [serving as a legal observer],” Kemble told a Wisconsin newspaper. Kemble’s camera was seized and she was taken to the Morton County jail, where she was held until a bond was posted. She now faces multiple charges that could put her in jail for two years. Among other things, North Dakota authorities have claimed the city council member was engaging in a riot. Documentary filmmakers like Schlosberg are entitled to the same protections that are accorded to print and broadcast journalists who cover breaking news. But the assault on freedom of expression by North Dakota authorities is more than a threat to the many forms of journalism that are protected by the First Amendment. What the authorities are doing threatens the quality of the public debate that is essential to democracy. It is for this reason that objections to these arrests must come from journalists, artists, activists, elected officials, and citizens of every background and political persuasion. The First Amendment was not added to the US Constitution merely to protect journalists. It was added with an eye toward protecting everyone who seeks to engage with and expand the public discourse through acts that grab the attention of the great mass of citizens: by assembling, by petitioning for the redress of grievances and by documenting those assemblies and those protests. But those who have sought to amplify the rising chorus of opposition to the pipeline have repeatedly been targeted by authorities. After Stein and Green vice-presidential candidate Ajamu Baraka joined protests in early September, the Morton County Sheriff’s Department announced plans to pursue misdemeanor criminal-trespass and criminal-mischief charges against the candidates for spray-painting a statement on a bulldozer blade that was already covered with anti-pipeline statements. As national media outlets that had barely noted the protests began to show interest, an arrest warrant (for criminal trespassing) was issued for Goodman’s arrest. “Authorities in North Dakota should stop embarrassing themselves, drop the charges against Amy Goodman, and ensure that all reporters are free to do their jobs,” said Lauría, speaking several days before North Dakota Judge John Grinsteiner determined on Monday that there no cause for the “riot” charge against Goodman. The point made by Lauría is an important one. But our concern about what’s happening in North Dakota cannot stop there. This is about the whole of the First Amendment, and the whole of a constitution that imposes a rule of law not just on citizens but on corporations and on prosecutors. The authorities in North Dakota are shredding the US Constitution with their assaults on the right to assemble, to petition for the redress of grievances, to document these assemblies and petitions, and to provide the people of North Dakota and the United States with the information that free peoples require in order to makes choices in a democratic society. Fox is right. No sincere and thinking American can be comfortable with what is happening in North Dakota—because what is happening in North Dakota is so fundamentally and so thoroughly un-American.